The temple Zuigan-Ji has taken a lot of damage during the earthquake on March 11, 2011, but it is now a shelter for the survivors. 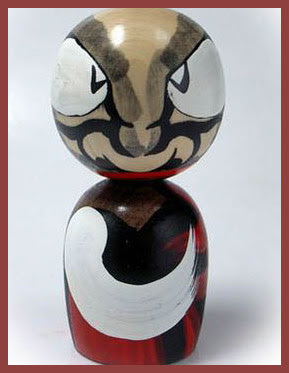 The souvenir Daruma doll from my father has become even more precious. 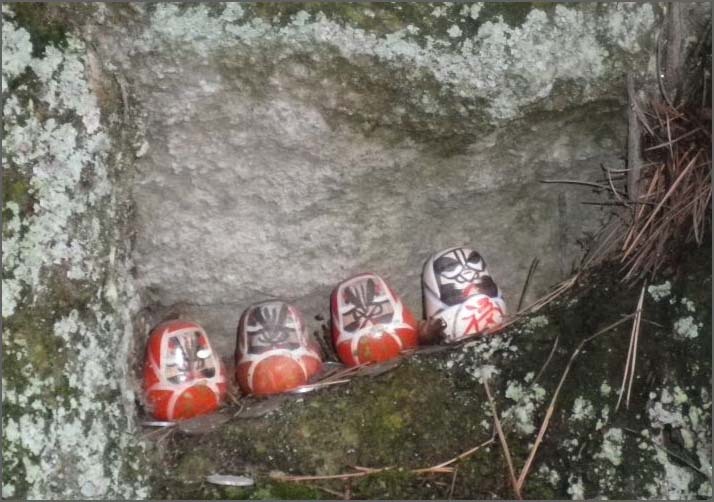 Sigrid from Germany has asked about the many little figures of Daruma she saw on her trip to Sendai and from there to the small island of Fukuura (Fuku-Ura, Fukura). She saw them under fallen trees and in caves. Her Japanese friends did not have any explanation for this. Fukuura-jima is a small island reached on foot over a vermillion bridge from the nearby temple Zuigan-ji. This island is a natural park where more than 250 different plants are growing. It takes about 1 hour 30 minutes to walk around the island. FUKU means auspicious and URA is a kind of inlet where the sea is quiet. The temple Zuigan-ji was founded in 828 as a temple of the Tendai Sect of Esoteric Buddhism. It is now one of the most famous Zen temples in Northern Japan, well known for its beautifully painted sliding doors (fusuma). The temple was restored to its present form by the famous feudal lord of Sendai, Date Masamune, around 1600. 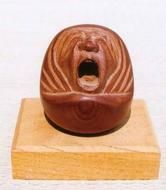 As you can see on this link, there are a lot of wodden dolls (kokeshiこけし) in the temple museum. Since usually you leave your bad luck at the temple, I guess people tend to leave the Daruma dolls which carry the oracle too, to make sure all is left behind. 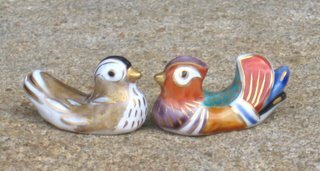 I have a lot of these Daruma-kuji in my museum, they are all a little different in the painting, about 2-3 cm high and come in white, red or wooden color. Daruma-kuji are sold all over Japan, not only at Zen temples, and the dolls are not considered of any worth, they cost about 200 yen, maybe 20 cents only. Basho is a great poet who composed many famous haikus about Matsushima. In the morning, a memorial service is held for Basho at Zuigan-ji Temple. In the afternoon, the National Haiku Contest is held and some famous local poets and renowned poets from central Japan select the best works. Later the winning poems are written on Byoobu (an ornamental folding screen) and exhibited at Kanrantei Matsushima Museum.
. WKD : Matsushima 松島 .